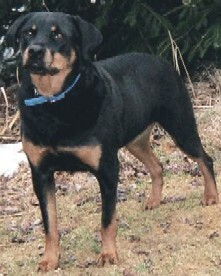 The Josie/Sadie Fund was begun a few years ago through an initial generous donation from Washington Winn, who wanted to start a fund to honor two of his beloved Rottweiler girls, named Josie and Sadie. 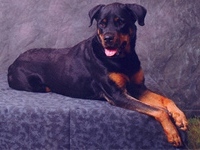 These were two wonderful Rottie girls who brought joy and companionship to a wonderful family. Unfortunately, they both died too soon of differing forms of cancer. Knowing how difficult it is to lose a beloved companion, Washington wanted to help provide a way for other families who own Rotties who have serious medical needs that require expensive treatment they cannot afford. 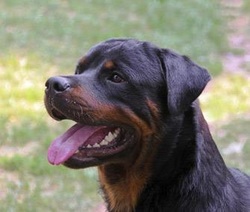 These families, even though they love their Rottie, are put in the position of having to either surrender their dog to rescue or euthanize them. The Josie/Sadie Fund provides financial assistance to these families to help pay for the expensive treatment their Rottie needs so that they can keep their beloved pet. Although Washington passed away the summer of 2011, his family continues to donate annually to this fund and we hope you will too. Portsmouth, RI 02871Please remember to write "Josie/Sadie Fund" on your check so it will go directly to the famillies needing expensive vet care.